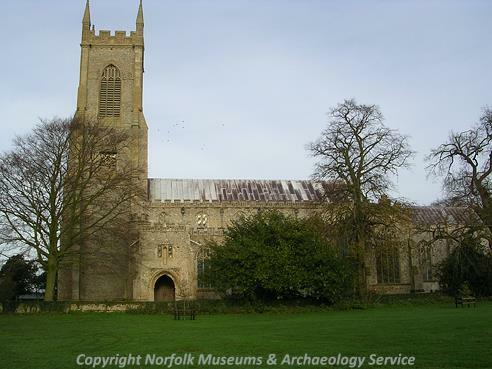 The Broadland parish of Salle is situated in mid-north Norfolk, to the northeast of the much larger parish of Reepham. The name Salle comes from the Old English for ‘sallow wood’, and it was certainly a well-established settlement by the time of the Norman Conquest, its population, land ownership and productive resources being extensively detailed in the Domesday Book of 1086. The earliest dateable evidence of human activity comes in the form of Neolithic flint tools, including polished axeheads (NHER 34990 and 34991), a chisel (NHER 3144), a chipped axehead (NHER 3145) and a fabricator (NHER 7451). Bronze Age flint objects include knives (NHER 37268 and 41992), a chipped axehead and an awl (NHER 30429). Copper alloy finds from the period are fragments of a spearhead (NHER 30974), axeheads (NHER 31346 and 50246) and a palstave (NHER 34992). Metal detecting in recent years has recovered two hoards of Late Bronze Age axes and other copper alloy objects (NHER 41976 and 42594). Scant Iron Age finds include harness fittings (NHER 30429 and 50247). No Roman structures have yet been identified, but quite a number of Roman objects have been recovered, including coins (NHER 30134, 30976 and 34991), brooches (NHER 30429, 34991 and 50246), pottery fragments (NHER 29291 and 30429), a sword chape (NHER 42705) and a belt fitting (NHER 30972). Examples of Saxon finds are brooches (NHER 30429), buckles (NHER 29291 and 30429), pottery fragments (NHER 30429 and 34991) and a strap end (NHER 40435). 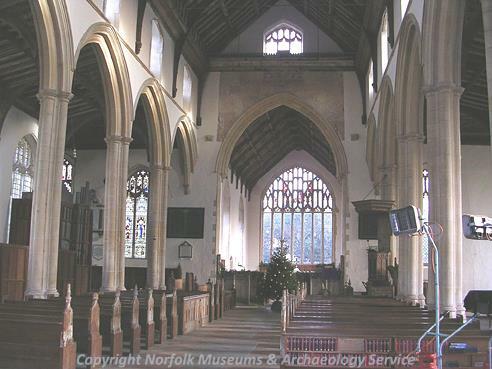 The medieval period has left the parish with its oldest surviving building, the church of St Peter and St Paul (NHER 7466). Standing alone and dominated by its tall west tower topped by richly decorated battlements, this is one of the most magnificent 15th century churches in the county, entirely of that period except for two windows which are probably 19th century. It contains contemporary painted woodwork items, a wonderful carved font and many other fine features. Other medieval structures have not survived. Stinton medieval village (NHER 7327), mentioned in the Domesday Book, has disappeared, though the remains of a moated site are still visible to the east of Stinton Hall Farm. The house that now stands within the moat dates to about 1860. Aerial photography and ground inspection in Salle Park (NHER 30485) have located the marks of enclosures, trackways and ditches in the area, suggesting the layout of a further deserted medieval settlement. Salle Moor Hall (see below) is set within a medieval moated site, as is Manor Farm (see below). A large number of medieval objects have been recovered, selected examples being coins (NHER 29232, 29291 and 30134), seal matrices (NHER 29232 and 35137), pottery fragments (NHER 29291, 30429 and 30447), a pilgrim bottle (NHER 30974), a gold seal ring (NHER 7418) and a key (NHER 41712). Of the post medieval buildings in the parish, probably the oldest is Manor Farm (NHER 7365). This is a late 16th century timber framed house with a brick west gable, aggrandised and extended in the early 17th century, including the addition of a magnificent Jacobean staircase. It was further altered and extended in the 19th century. Most of the interior dates to about 1910. It is now the offices of the Salle Park Estate. 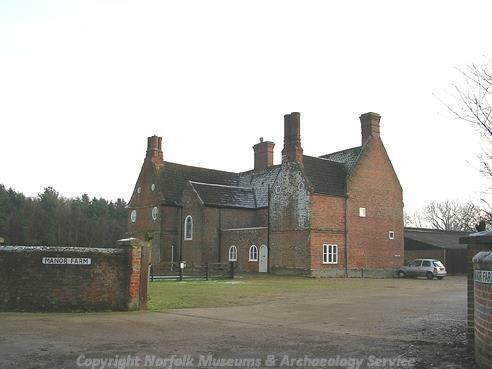 Salle Moor Hall (NHER 3149) is a grand late 17th century knapped flint and brick mansion with 18th and 19th century alterations, possibly with an older core and certainly on the site of earlier houses. Stinton Hall Farmhouse (NHER 12727) is a 17th century and later three storey farmhouse, the top storey being in gables that rise up from the façade, the central gable projecting as a porch tower. The west extension dates to 1888. Salle Park House (NHER 7458), built in 1761 by Edward Hase after his wife Vertue Repps had inherited the manor, is a big three storey Palladian brick house with a seven window bay façade, the central three bays projecting under a pediment with an elaborate coat of arms. The house was altered in 1862, including the addition of a now demolished west service wing. The single storey east and west wings, the east containing an orangery, were added in 1910 by Sir Woolmer White, and most of the interior is of the same date, though the chimney-pieces in the saloon, drawing room and dining room are original. The house is set in Salle Park (NHER 30485), and in the grounds is a good example of a brick icehouse (NHER 7457), recently restored. To the northeast is Cherry Tree Farm (NHER 41850), an 18th century two storey red brick house with a pantile roof and a later extension to the east. Walk Gate Cottages (NHER 37491), formerly the lodges of Salle Moor Hall, are 19th century, as is Gatehouse Farm (NHER 41849). P. Aldridge (NLA), 25 May 2007.